Does your child or adolescent need a 504 Plan or an IEP? 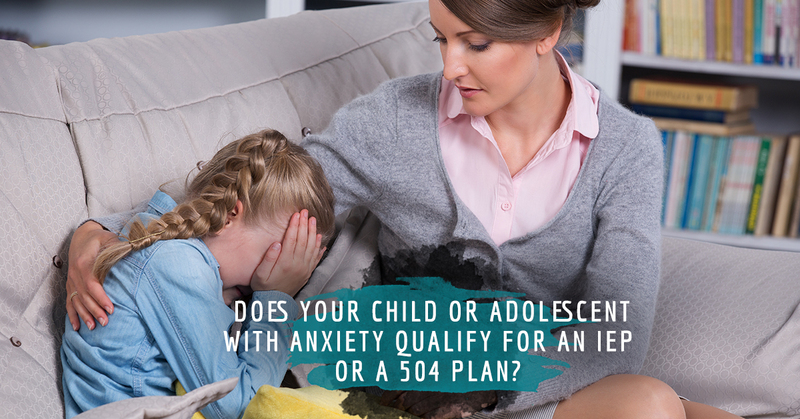 Does your child or adolescent with anxiety qualify for an IEP or a 504 Plan? At Dr. Angela Reiter & Associates in Eastchester, NY, we can assist you in determining whether an IEP (Individualized Education Program) or a 504 Plan is more appropriate for your child or adolescent experiencing anxiety. A federal law called the Individuals with Disabilities Education Act (IDEA) requires that public schools create an IEP for every child receiving special education services. Kids from age three through high school may be eligible for an IEP. An IEP is meant to address each child’s unique learning issues and include specific educational goals. An IEP includes: A statement of how your child is doing in school now, annual educational goals, special education supports and services, modifications and accommodations, accommodations allowed when taking standardized tests, how and when the school will measure and review progress toward annual goals, as well as transition planning. Accommodations are changes in how a child shows what he or she has learned, such as extra time on tests. Modifications are changes in what is taught to or expected of a student. It is important to understand that a physician or another medical professional (like a psychologist) and not the school, can diagnose medical and psychiatric conditions. This includes ADHD, learning disabilities, mood disorders, and anxiety. School evaluators don’t offer “diagnoses.” A comprehensive evaluation is often necessary to provide an accurate diagnosis and then recommend the accommodations and modifications for an IEP Plan. There are 13 disabilities covered under IDEA that qualify for an IEP plan. This list includes: Autism, Deaf-blindness, Deafness, Emotional disturbance, Hearing impairment, Intellectual disability, Multiple disabilities, Orthopedic impairment, Other health impairment (including ADHD), Specific learning disability (including dyslexia, dyscalculia and dysgraphia, among others), Speech or language impairment, Traumatic brain injury, Visual impairment, including blindness. In order to be eligible, a student must: Have a disability. As a result of that disability the child must need special education in order to make progress in school. If, for example, a student has ADHD but is doing well in school, he might not be covered by IDEA. Does anxiety fall under one of the 13 disabilities covered under IDEA that qualifies for an IEP plan? The answer is not a definite yes. Anxiety can fall under IDEA, but it is not an automatic qualifier. Anxiety could fall under two of the thirteen categories. 1) Emotional disturbance (ED). An emotional disturbance is broadly defined as a condition where the child exhibits one of more of the following over a long period of time: Inability to learn that can’t be explained by intellectual, sensory or health factors, Inability to build or maintain appropriate relationships with peers and teachers, Inappropriate feelings or behaviors under normal circumstances, General pervasive depression or unhappiness. 2) Other health impairment (OHI). This means the child has limited strength or alertness to the educational environment related to a health condition. It also can refer to a heightened alertness to stimuli, like in the case of severe anxiety or PTSD. If your child is only experiencing anxiety issues, they may not qualify for special education services and an IEP. Anxiety in children alone is not considered a qualifying condition unless it is severe enough to warrant the label of Emotionally Disturbed. However, anxiety in children is covered under Section 504 of the American Disabilities Act and your child can receive modifications and accommodations in their classroom through a 504 plan. This can include extra time on tests, taking exams in an alternative setting, alternative homework assignments or adjustments in their school day. Let Dr. Angela Reiter & Associates in Eastchester, NY assist you in determining whether an IEP or 504 Plan is most appropriate for your child or adolescent with anxiety.